While I am writing this blog many people might have know about fiverr.com. This site is made for people who want hire their online work or hire services online in a very low cost. Also people who have some sort of skill they can sell their services or work for $5. 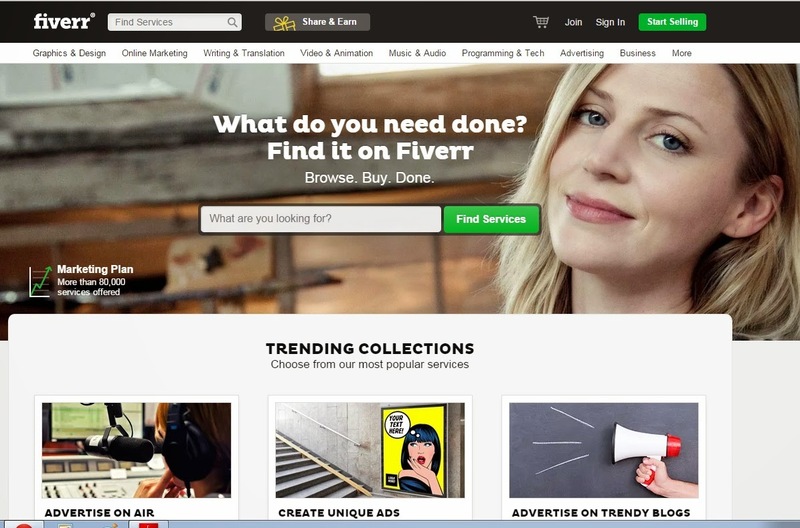 On fiverr you can sell anything for $5 per gig and one thing you must keep in mind that you get only $4 and $1 goes to fiverr company. You might be thinking why only $5 not less or more than $5 than i think they have studied the market and we can get many things for $5. Fiverr is a great place to sell and you can offer many services ensure that you are following all the rules and regulations of this site. You will need positive feed back from customers and for this you have to give quality work with good customer support. If you have many negative feed back then your account will be deleted and without any prior notification and if you have any money inyour account then they will not pay you. Fiverr account is free to join they don't take any free or yearly free from your account instead they take commission $1 from every gig. You can create account with facebook account then will verify your account by sending verification link to your mail. evenif you dont have facebook account you can still login. while creating account choose account name similar to your business as it will show that your profesional. You must see what your competitors are doing judge their quality and their feedback. This will let you know your place. Keep in mind you have to sell item in a very short time. you should deliver before time otherwise your customer will annoy. while doing so you will it difficult to deliver on time but remember it will affect your feedback. You may have to promote your gig on Facebook or twitter. become assistant for 2 hrs. Create a good looking gig starting with i will ...............for $5. You must choose high quality image as image talks. If you cant write much enough then your image should tell what you are offering and how is your quality. Satisfy your customer if any thing goes wrong fix it before they give negative feedback negative feedback will affect your future lead. Be polite while conversation with your customer. Ask for any comments feedback before final review. You can also outsource your work by other means on internet and give here fiverr will also make you profitable.